Well, you have spoken! When I asked what subject you wanted for a tutorial, there was a very clear majority for jumpsuits (although I plan on making a shelf bust tutorial in summer. I was quite impressed with Ms. Pollyanna still remembering that dress after such a long time). It seems I have misunderstood the time table for Sew Grateful Week though. 'Sharing Resources Day' was yesterday. I don't think it makes much of a difference though. It's more about the spirit of sharing knowledge and skill. 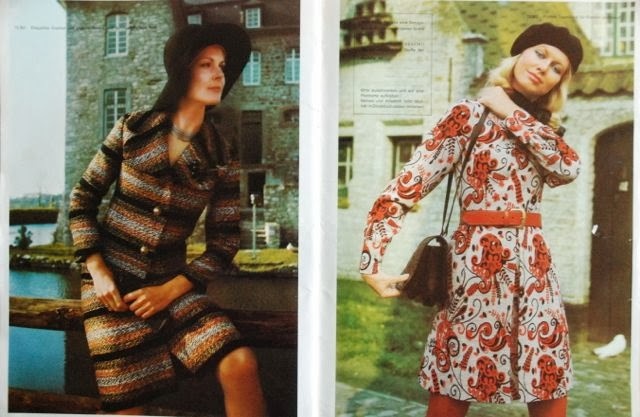 Anyway, on to jumpsuits and their little sisters, the playsuits. I have noticed there is a bit of confusion about the term 'playsuit'. It is often applied to short legged jumpsuits but also sometimes to 1950's sets of shorts and tops. That's not the kind of playsuit I'm talking about here though. 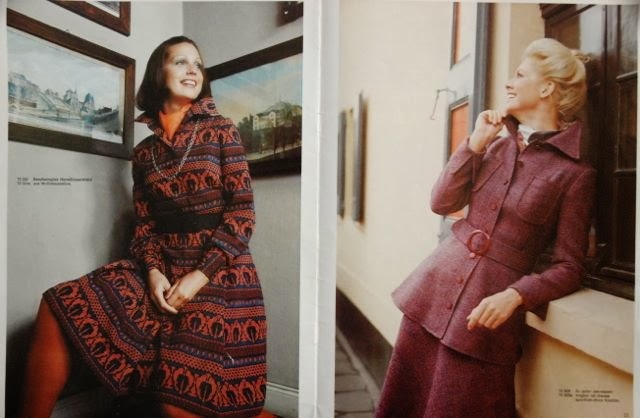 There are many different kinds of jumpsuits and I will discuss the varieties one by one. There are two things they all have in common though: 1 Torso length is a major issue. That's what I'll discuss below. And 2 You should make the closure at center front. A side zip won't work because you can't get out of the garment by pulling it up over your head. You really need to make a closure which will allow you to get your whole body through the opening at the top. In theory, a back zipper is possible as well but because you will need to open it for bathroom breaks that may not be so practical. You have to think about the closure when drafting. 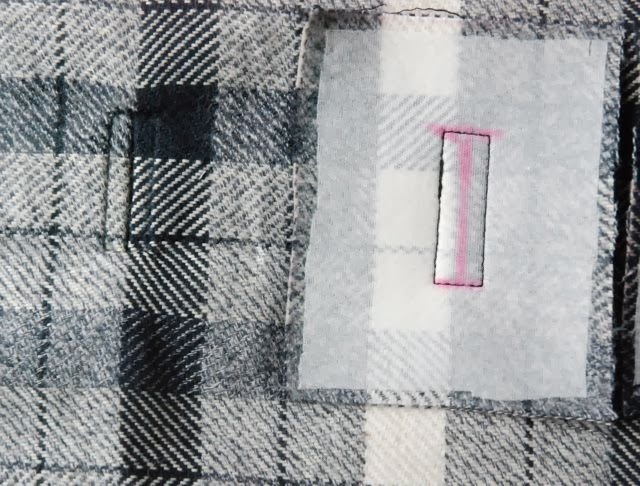 You don't need extra width for a central (blind or visible) zipper but for a button front, you need to make an extension of two centimeters past center front for the length of the closure (excluding seam allowance). Like this. In both cases, you should make a facing as well. With a waist seam and a fitted bodice. 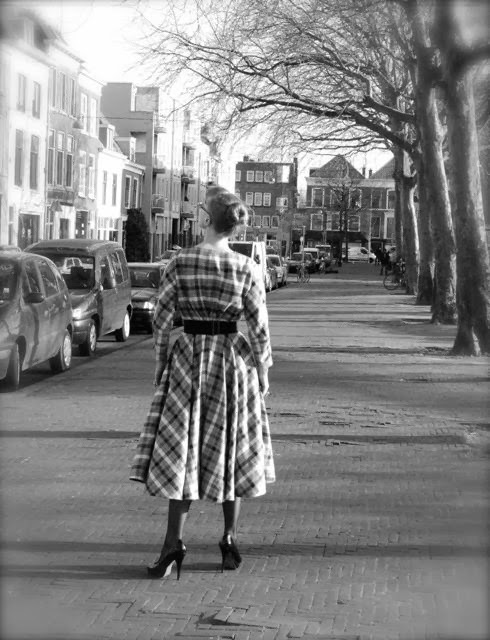 Depending on your choice of bodice and trousers it can look 40's, 50's or just elegant. You can use slopers to draft this jumpsuit but you don't have to. If you don't have a sloper and/or don't feel like having to consider and draft all design details like collar, sleeves and pockets, you can pick any bodice from a dress with a waist seam and add high waisted trousers or shorts. As with all pattern making, make sure the patterns you use are tried and tested. You can't just connect the bodice and trousers like you would for a dress. That would cause those notorious length issues. You need to add extra length in the body of the jumpsuit to be able to do things like sit down or reach your arms up. In this style, the extra length is added to the trousers. My pattern making book tells to add "between 3 and 10 cm" at the waistline of a jumpsuit. Which is too wide a margin to be helpful. I've tried and tested this in my own jumpsuit and I found out that 3 cm often isn't enough. For a jumpsuit like this, based on trousers with a normal, fitted crotch, I add 5 cm. Do this by moving tracing the pattern and tracing the tops of front and back again, 5 cm higher but with the center front and back lined up with the original center front and back. Merge the side seams gradually into the original side seams but make sure you don't narrow the pattern pieces at the (new or old) hipline. Then, you have to make sure the waistlines of top and bodice match. Usually, you will find that the trouser waistline is smaller than the bodice waistline. Stick with the wider one. That tends to mean you lose the front dart in the trousers. You can make scoop or slant pockets in the trousers. This is a closely related style. horizontal seam below the waist, (semi) fitted bodice. 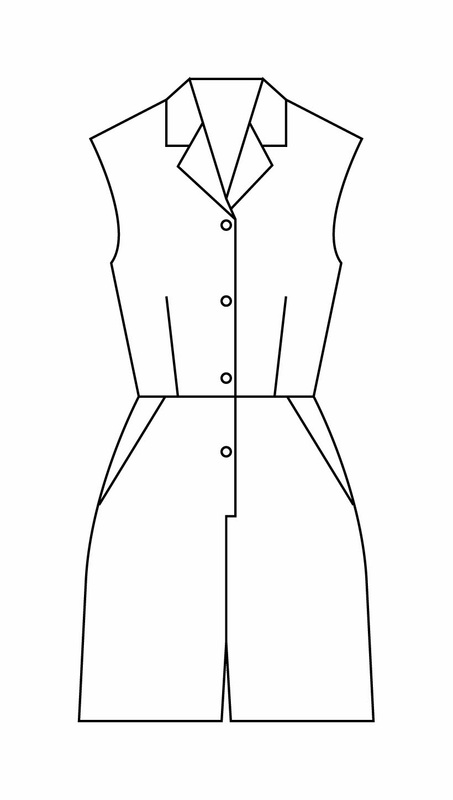 For this one, you can use a pattern for a (semi) fitted top or dress without a waist seam. The same rules apply as for the previous jumpsuit. No length is added to the bodice, which extends to about 8 to 10 cm below the waist. Add 5 cm at the tops of front and back trousers (the top of which should be at the same level below the waist). 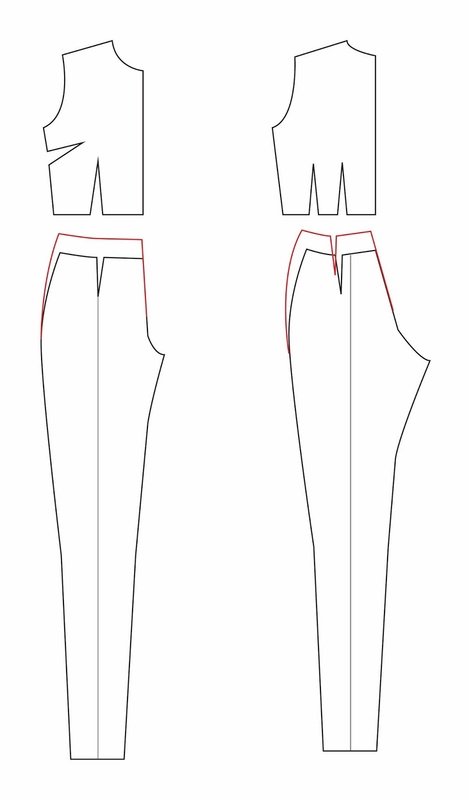 Make sure the width of bodice and trousers is the same at the seam line. Then, we get to the style which you see most in RTW. The loose jumpsuit with elastic or a drawstring at the waistline. The reason you see this one so much is that it's a lot easier to fit. The style is supposed to be baggy, so extra length is the body doesn't attract attention and you can kind of regulate it with the gathering at the waist. I don't know why this image keeps uploading all blurry. It isn't like that in Illustrator or Photoshop. I've tried again and again to get it right but nothing works. I'll try again tomorrow. To make this, you either widen sloper bodice and trousers or you use a loose fitting top and bottom. In both cases, you add the usual amount of length at the top of the trousers but also 3 to 5 cm at the bottom of the bodice. When sewing, you can either sew elastic to the waist seam allowance after sewing the waist seam or you can create a casing for elastic or a drawstring. Because of the loose fit, you don't have to make such a long closure in a jumpsuit like this. A zip or row of buttons can stay above with waistline so it doesn't interfere with the gathers. You can also design this type of jumpsuit to have the gathers at another level than with waist but in that case, I don't recommend using tight-ish elastic. That would creep to the waist. When sewing any of these jumpsuits, construct top and bottom separately apart from the from opening on the fitted styles, then sew the waist seam and then finish front and make the closure (on the fitted styles) or insert elastic or drawstring (in the loose fitting jumpsuit). Now, only one style remains. And this is one I haven't successfully made myself. Not yet. A jumpsuit without a waist seam. You may think this is how overalls (and other jumpsuits made for dirty work) are usually shaped. Some are but certainly not all because this is not a style which suits itself to economical cutting. To make this style, you have to extend the center front line on the trousers and trace the bodice with its center front on that line. You have to leave at least 5 cm between both waistlines. Do the same at the back. This puts the back bodice at an angle. Measure the side seams on both pieces. They have to be the same length. If they're not, adjust the position of the bodice pieces to make the side seams match. 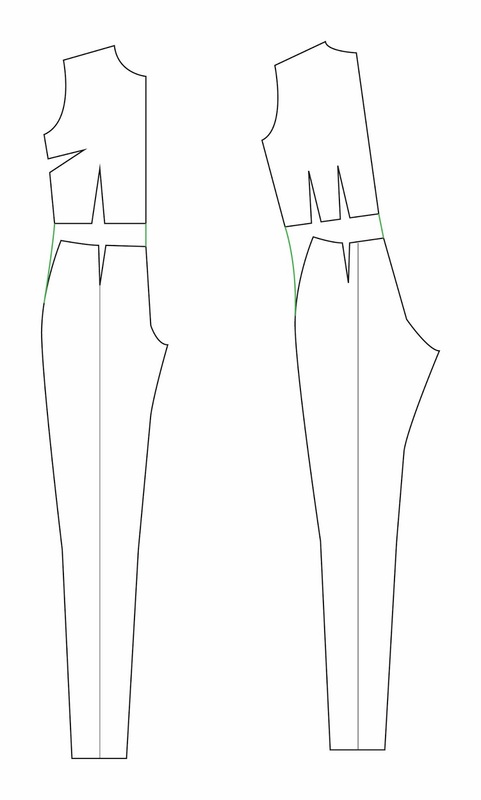 Just make sure that the total amount of length added to the crotch seam (front and back combined) is still 10 cm. All measurements described here are for use with normal trousers which are fitted at the crotch. If you use a style with a lowered crotch line, like some belt pleated trousers or culottes you could get away with adding less. Although, to preserve the look of the trouser style, I would still add 5 cm unless I was dealing with trousers with a seriously low crotch, like the hareem pants which were in fashion a couple of years ago. The added length at the waist will make the trousers longer. However, if that is possible with the style of trousers you're using I would recommend only taking away the excess length when hemming the legs as the very last step in construction. It's only then that you can see how the legs behave when you wear the jumpsuit. I hope my explanation will help you make some jumpsuits of your own. As ever, if you do, I'd love to hear about it (or better yet, see it) and if you have any questions, just let me know. Did last night's episode of The Great British Sewing Bee spook you? For those of you who haven't seen it yet: I hope it's not to much of a spoiler if I tell you the 'theme' was print matching. 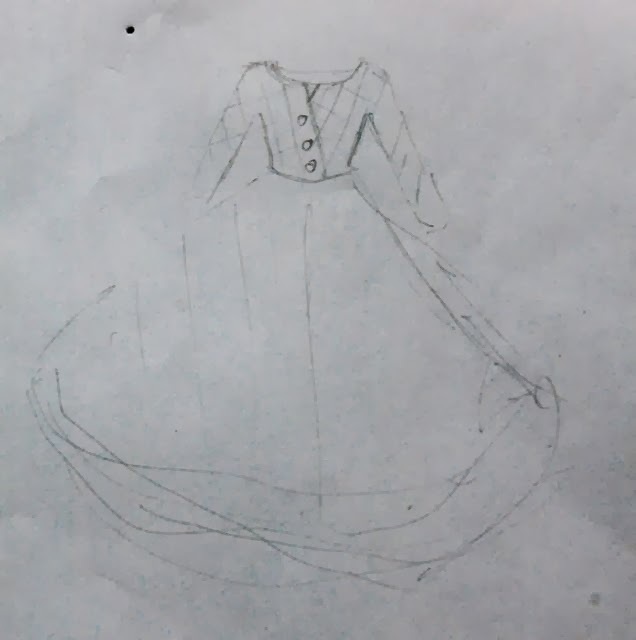 I saw this dress in a museum today. 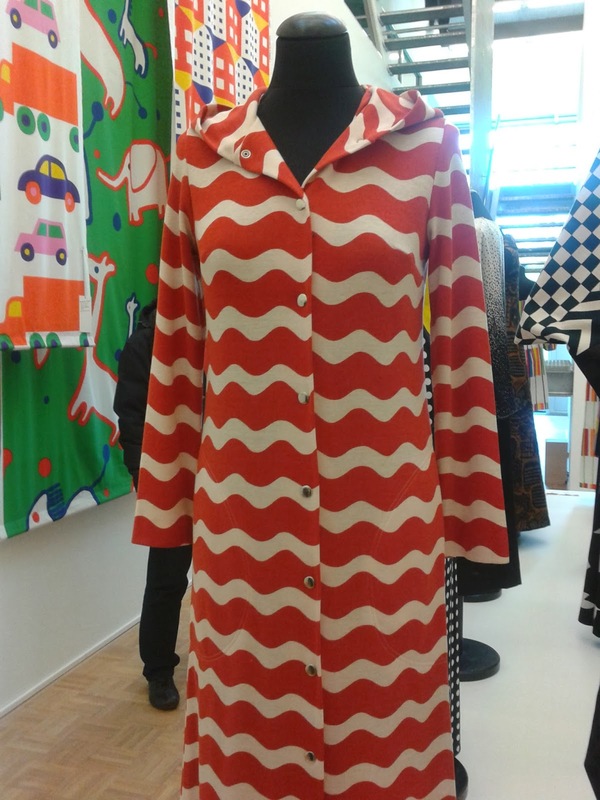 It was in the exhibit about the iconic Swedish brand Marimekko (mostly known for their prints) which is held at the Kunsthal in Rotterdam (a museum which is basically an empty box which is filled with five different exhibitions. Subjects range from contemporary art and design to ancient history and anything in between). 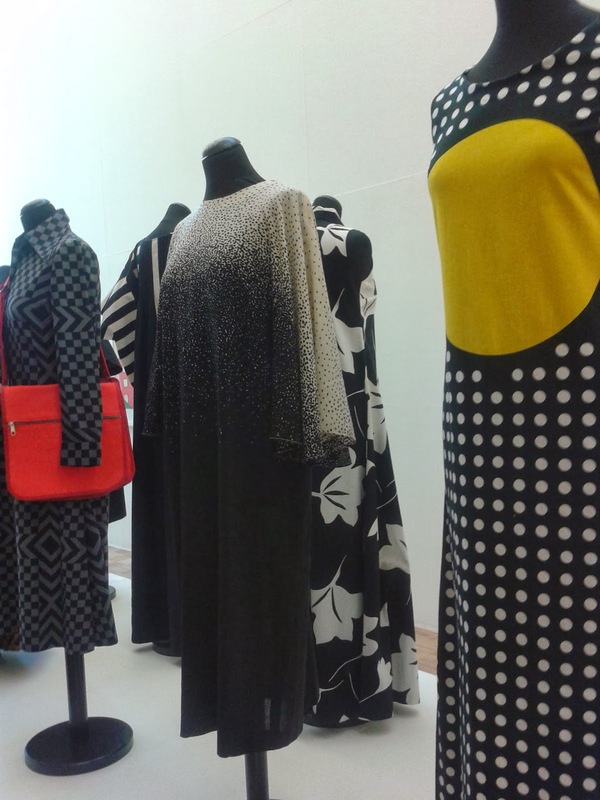 The Marimekko exhibit was fairly small and consisted of printed fabric and garments. 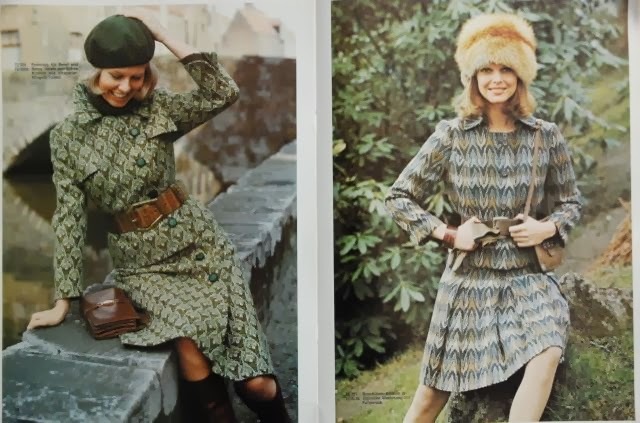 Some of those, especially those made from thickish woven cotton, looked quite well made and were great examples fashion from their era (mostly the 1960's and 70's). 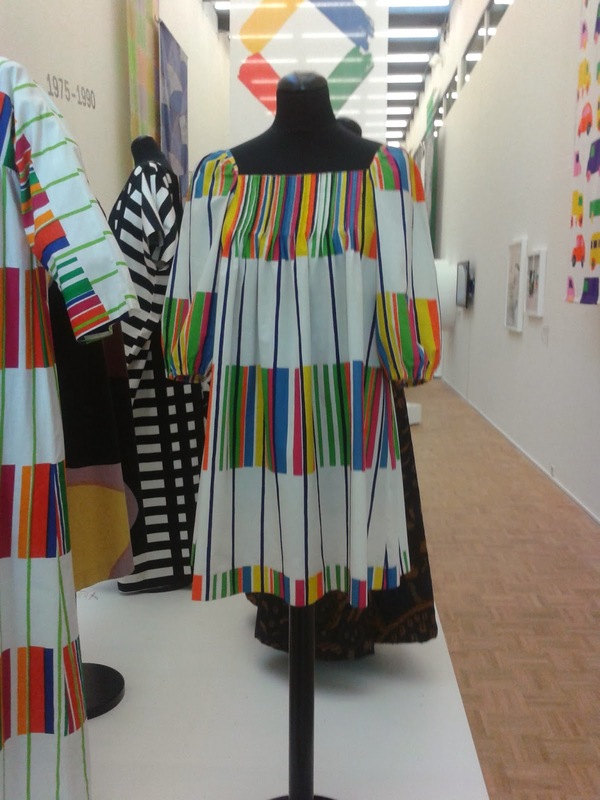 Don't get me wrong, I'm not writing this to be negative about Marimekko or about the display at the museum. I just think it's a nice reminder that even internationally renowned brands don't always get it right. 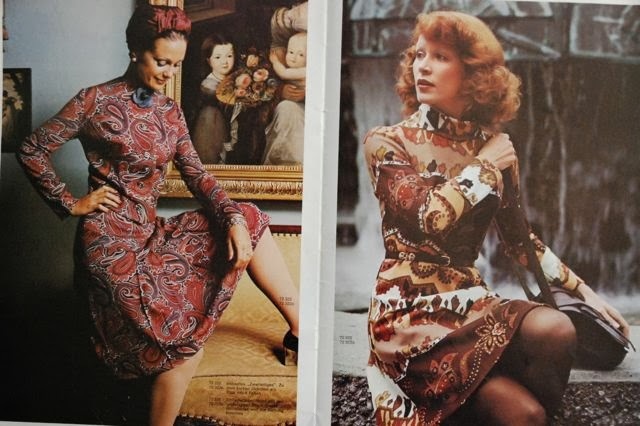 In fact, most of the garments on show used the prints in rather fabulous ways. Like this dress: he top part is pintucked which works very well with the stripes. 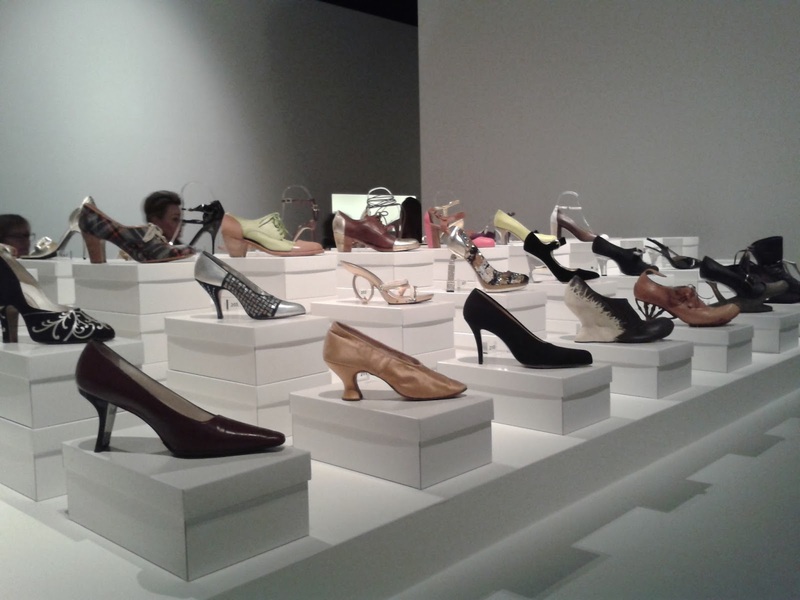 And if you like fashion, you'll probably also like one of the bigger exhibitions which is held at the Kunsthal right now: S.H.O.E.S. I've just finished my plaid flannel dress! In the end, it turned out I had just enough fabric to give it a full circle skirt, so I did. Then, I left it to hang for a week before hemming. To deal with 'growing' on the bias. Today, in what was otherwise a rather busy weekend, I found enough time to check and adjust the skirt length, hem the dress and have some pictures taken. Despite the fact that it may soon be too warm to wear this dress, I'm happy with it. My new sloper provides quite a bit more ease in the chest (which makes sense because that's where my measurements changed the most) but I think that helps to suggest an hourglass silhouette. Like I explained before, I shaped the bodice with pleats instead of darts. 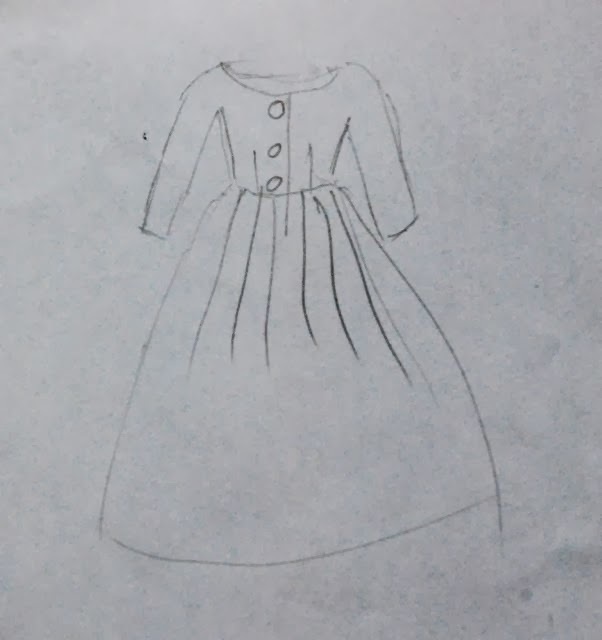 At the front, all shaping is done with those deep pleats from the shoulder which, because they line up with the front overlap, also look a bit like a collar. At the back, there is a row of small pleats at the waistline and I kept the shoulder dart and moved it to the center back seam. When I started sewing, I wasn't quite sure how well this pleated bodice would keep its shape, so I made a sleeveless lining with regular darts stabilize it. Now, I think it may not have been needed but it also provides a nice clean finish. I cut the bodice pieces to match the plaid on the outer arm seam. That worked fairly well even though I had to alter the sleeves when I found out that the elbow darts had somehow ended up way too low and the sleeves were too wide (this fabric has more 'give' than muslin, so that must have been part of the trouble. I may also not have paid enough attention to the position of the elbow dart when trying on the toile). There is a hidden zipper, to allow the dress to be opened at and below the waist (not unimportant to get in and out of it). Normally, I would have put that zipper at the side but in this case, I couldn't do that. 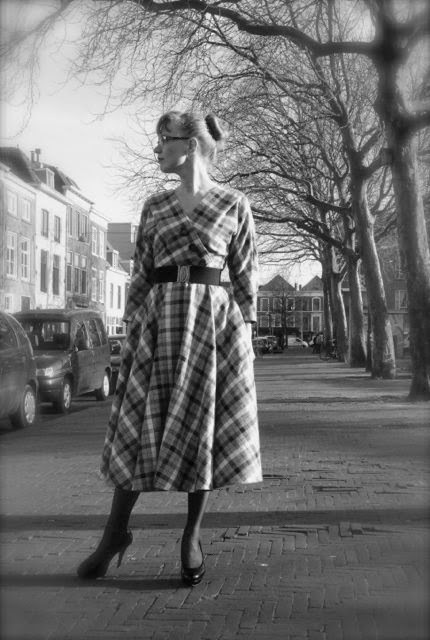 To make it possible to match the plaid in the skirt, I cut the front as a perfect half circle and the back as two perfect quarters… And as a result, the skirt side seams don't meet the bodice side seams because the back bodice is narrower at the waist than the front. So, I put a blind zipper in the center back seam, from about 12 cm above the waist to 10 cm below. It works just fine and zipper pull doesn't attract attention, hidden as it is on that pleated back. Oh, and there are pockets in those skirt side seams. My beloved old coat isn't the only trusty, much-used item which is dying… My favorite bag seemed to be going through the same, slow process. 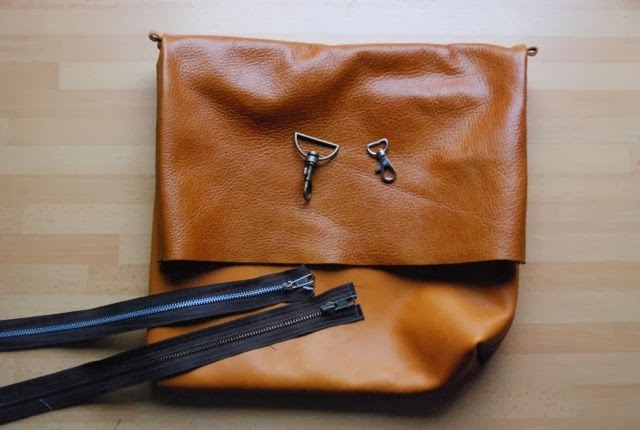 I'm sure I've made a blog post about this bag just after I finished it, but I can't find it now. 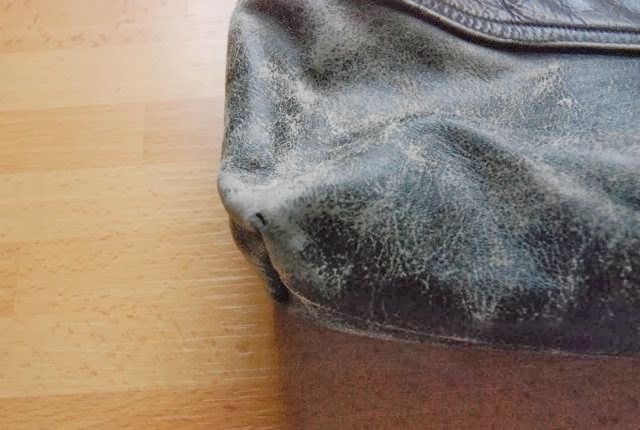 So, let me tell you that the leather always had a bit of a battered look. I made it from an old motorcycle jacket (which was given to me by a friend). 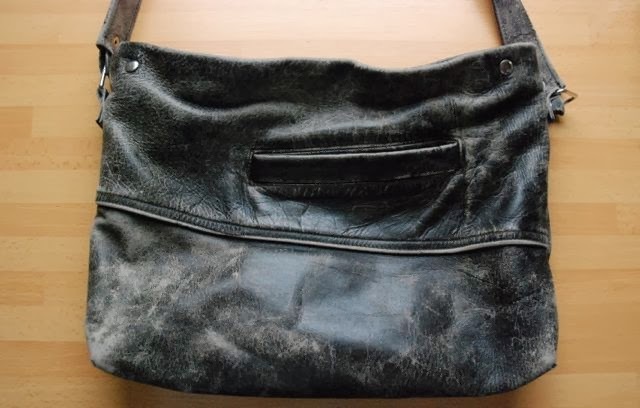 The leather looked nicely worn but was still quite sturdy. I used one of the pockets on the front of the bag. Other than that, it was a pretty basic, rectangular bag with a zipper closure and shoulder strap. 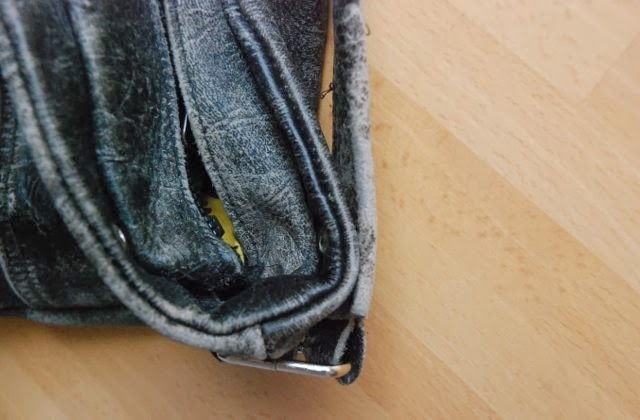 Over the past months, I had noticed that the corners were starting to wear out (unfortunately, demands of pocket placement had forced me to use a thinnish bit of the leather there). And the stitching of the top panel broke at one end (probably just from pulling at the zipper again and again and again). Because it didn't go past the corners, it wasn't a big problem and it would have been almost impossible to fix because I put in grommets at the corners after sewing this bit. But then, about two weeks ago, the zipper suddenly got stuck without reason whenever I tried to open the bag. This annoyed me for a while until the day that no amount of fiddling would suffice to convince it to open anyway. The zipper pull came off. I had to cut the zipper tape to open the bag. If the zipper hadn't failed, I would have continued to use this bag but now that it has, I don't think it's worth repairing. In fact, I don't think I could because of those grommets I mentioned above. I'm sewing a new bag now. 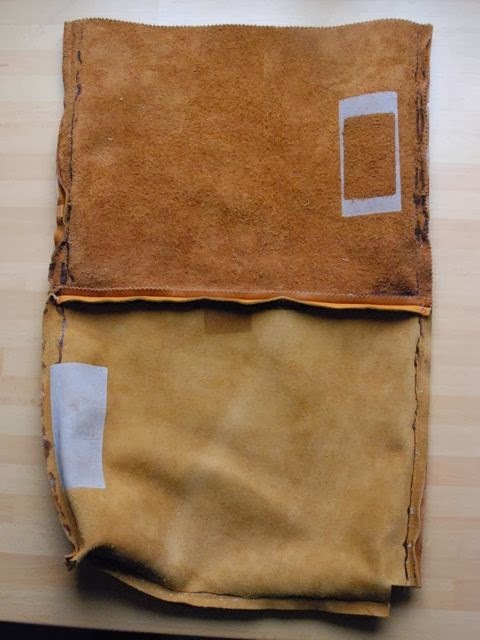 The shape is, again, quite simple but instead of old leather clothing, I'm now using bits of leather which had a previous life colour samples for a furniture store. Which means it's thick leather. My sewing machine handles it very well except at those points where two seams have to be sewn to each other, so it has to sew through eight layers of the stuff. And to do the machine justice, the side seams went fine. The leather on the top is a bit thinner which must have helped. It's just those cross seams on the bottom (only one sewn yet in these pictures) which were tricky. When sewing leather, I usually glue the seam allowances down. With thin leather, you have to be really careful it won't show on the outside. With this stuff, it's pretty difficult to make them stick, even if you let the glue dry while weights keep the seam allowances in place (if you're interested, my tips for sewing leather are here. And I can add that with the top feed option on my sewing machine, I don't have to resort to stitching through tracing paper). Here is the second Frohne magazine I mentioned. 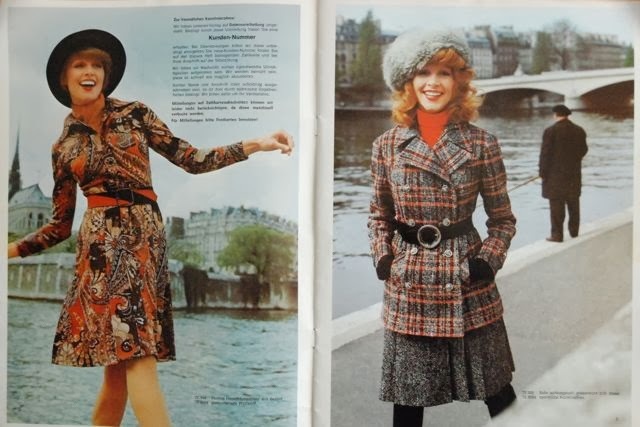 It's from the winter of 1972 and it pretty much continues the trends seen in 1971. 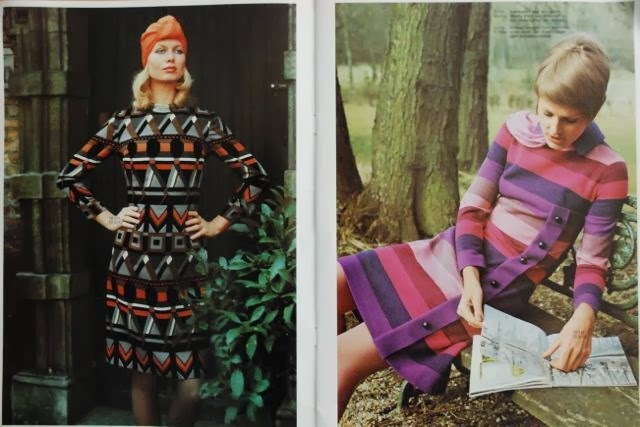 I'm studying these a bit better now because I think I would like to make something from either of these magazines as part of my vintage pattern challenge. I'd love to try this strange pattern system. 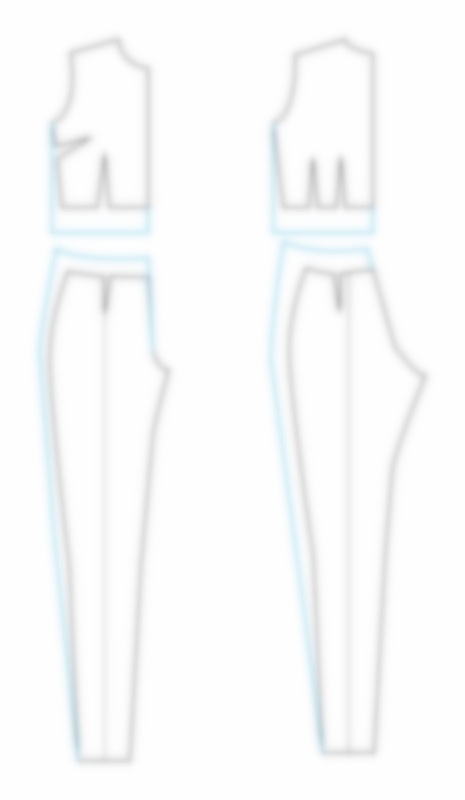 All those dots are 'anchor points' which you use when enlarging these with the special tool. I will make sure to document every step in the process when I get started on one of these. 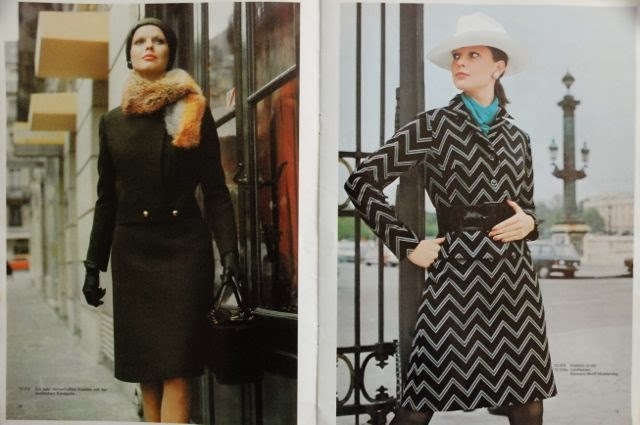 Again, there are some really nice coats and jackets are some rather simple dresses in really bold prints. The interest in headgear seems to have increased. 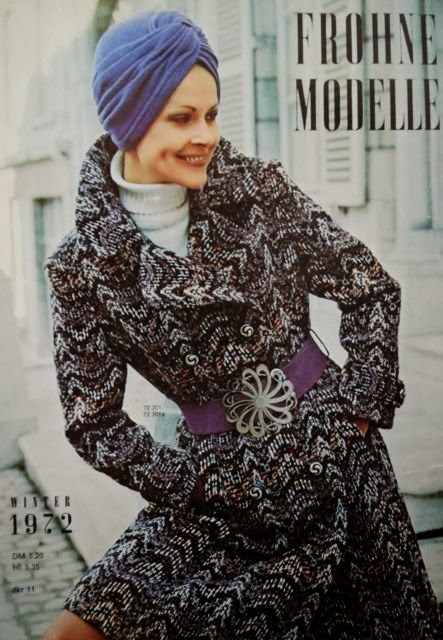 A lot of the outfits in this magazine are styled with turbans, berets and floppy felt hats. This party wear spread is particularly wacky. It seems like they put the outfits for some very different festivities on these pages. 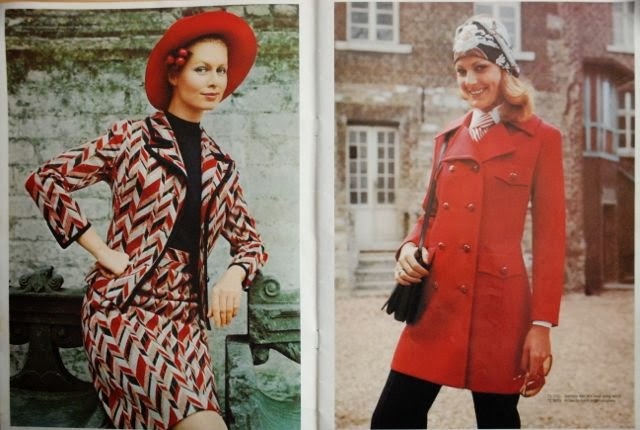 This suit (or at least the jacket) on the left is one of the designs I'm thinking about making. Do you like the designs from this decade? And if you remember the 1970's firsthand, do pictures like these make you feel nostalgic or just a bit horrified? Actually, I've just finished the bodice and decided to go with a half circle skirt. However, this post is about something which happened earlier. About the first step of construction in fact: the bound buttonholes. 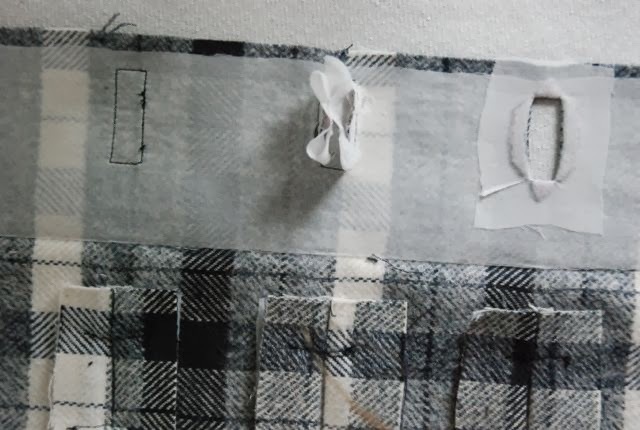 I decided to try and match the pattern by cutting the squares for the welts at exactly the same positions on the checks as the position for the buttonholes. So, I was going for this. I'm just really pleased with how well it turned out. Did I mention this fabric was nice to work with? I used lightweight knit fusible interfacing both to reinforce the fabric around the buttonhole and to stabilize the welts. And here's something which might be a useful little tip. In a lot of instructions for bound buttonholes, they don't tell you how to do the back. Obviously, you're going to need matching holes in the facing but somehow, in a lot of tutorials, they just assume you'll know how to do that now. When I first started making bound buttonholes, this really puzzled me. Designer friend M taught me to use the fashion fabric to make windows in the facing. I did that only once and thought it, combined with the front of the buttonhole, caused way too much bulk in the finished garment. After that, I would always use thinner fabrics. This works fine although you'll want to use something which is both densely woven (to avoid fraying) and presses well. I know a lot of people use silk organza for this kind of work, but I've never been able to find that (in real life, I mean. I'm sure I could find it online but I like to touch fabric before I buy it). A little while ago, I came up with another option. I'm sure it's not a new idea but I haven't seen it in tutorials before, so that's why I thought I'd better share it here. Instead of fabric, I sew a square of fusible interfacing to the facing. Right sides together, as usual. You want to pick a variety with is both thin and sturdy and can't get frayed or pulled apart. Knit versions, like the one I'm using here, fit those requirements nicely. Then, you just cut the window as normal and pull the square to the wrong side of the fabric. Carefully pull it into position and fuse. Et voila, a perfectly secured window for the back of your bound buttonhole! Unusually for me, I've been pretty organized about blogging lately. So organized, in fact, that the nasty cold I had over the weekend didn't even have an effect on posting (if you emailed me with a question though, that's why I haven't answered yet). And there's even a bit more lined up. But today, I thought I'd talk about what I'm working on right now. Despite all my good intentions when I told you about my poor old coat, I've allowed myself to be distracted by a pretty dress. It is one which has taken a while in planning. I bought this fabric either in December 2012 or early in 2013. I remember because there was this one stall at the market which was suddenly selling nice cotton flannel in various check designs at a low price (even if you considered the narrow width: just 90 cm) back then. This shirt for E was the first thing I made from that stuff. It taught me that this material was nice to work with, nice to wear and it took well to normal wear and laundry. So I bought more, in the various designs I thought we would like. My flounce dress was made from one of those (and I made a shirt for E from that same fabric earlier). 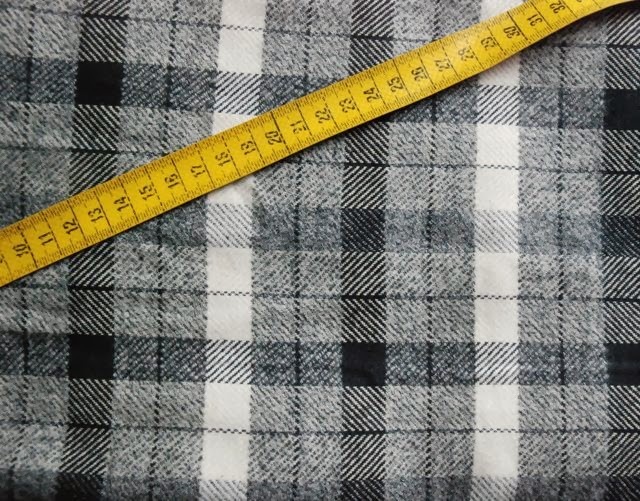 Now there's only one check flannel fabric left, it's the largest and the most eye-catching design and it is the only one I originally bought to make something for myself. The black and white stripes are horizontal and that tape measure is in centimeters. When I bought this fabric, I thought it would become something I called a 'lumberjack-dress'. 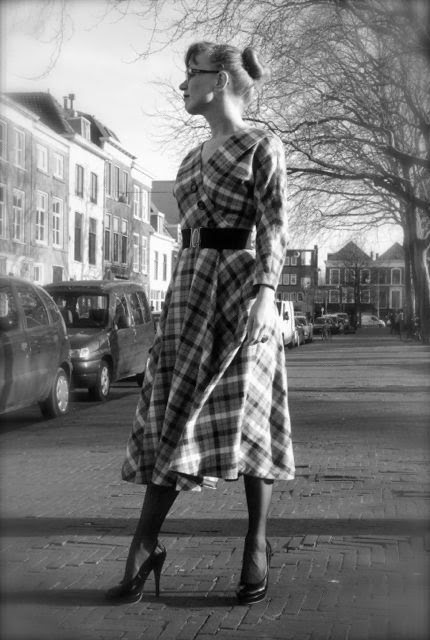 A design which would combine features of the lumberjack shirt and a 50's style dress. But I couldn't decide between a pleated skirt, a gathered one or maybe a circle or half circle so I left the fabric to marinate a bit in my stash. Last autumn, I thought about it again when I took a look at the new fashion according to the runways. I blogged about that. It became more and more important to me to really make use of those checks, so this looked like a big improvement. And then I stood in front of a mirror, draping the fabric over me. That made me realize it: the design was still wrong. Overlapping bodice fronts with a true V neckline, kimono sleeves with underarm gussets, all the darts at the front converted to a deep pleat at the shoulder. At the back, there is a series of small pleats instead of the normal waist darts. This is the design I drafted, muslined and cut out in that fabric. I haven't cut a skirt yet because I wanted to see the bodice in real life before I took a decision about that. Sewing community work, that is. Obviously, I like to interact with other people who are interested in sewing, (vintage) fashion and other related subjects. It would be very strange to have a blog if I didn't want that. Over time, I've also been part of a few online communities sharing specific interests within that field. 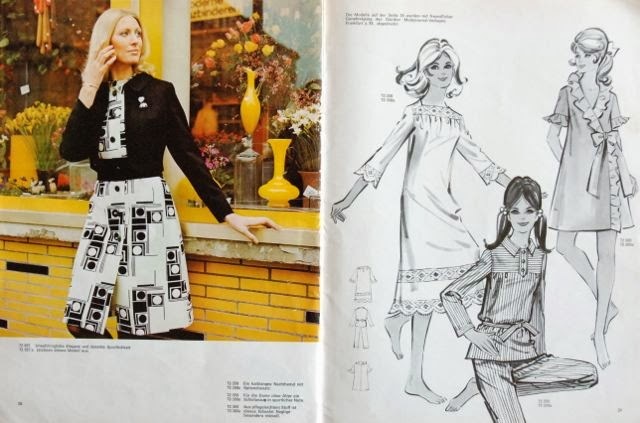 Burdastyle (still a member but I think it has grown out of its community feel), Wardrobe Refashion (I left when it stopped in its old form, but when I did a search for it for this post, I found out that it has had a new start) and, most recently, We Sew Retro. I like those as an opportunity to meet new people and it's just fun to be part of a group with shared interests. Despite those warm feelings about the online sewing community, I've rarely taken part in sew-alongs or challenges. I've started a couple of times and I've had good intentions about others but in the end I usually dropped the ball. The main reason is simple. Sewing is my hobby. Because my work also involves sewing, it's already a bit of a struggle at times to keep it fun. So, the last thing I want is to weigh it down with obligations. This time though, I'll try again because this challenge ties in really nicely with something I want to do anyway. It's not too confining and I think having a group of people with the same goal may, in this case, actually help me to stick with my target. 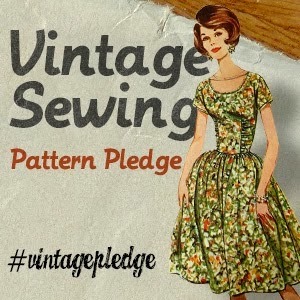 I've decided to join the Vintage Sewing Pattern Pledge. It was started by Marie of a Stitching Odyssey because she wanted to make more use of her vintage pattern stash. 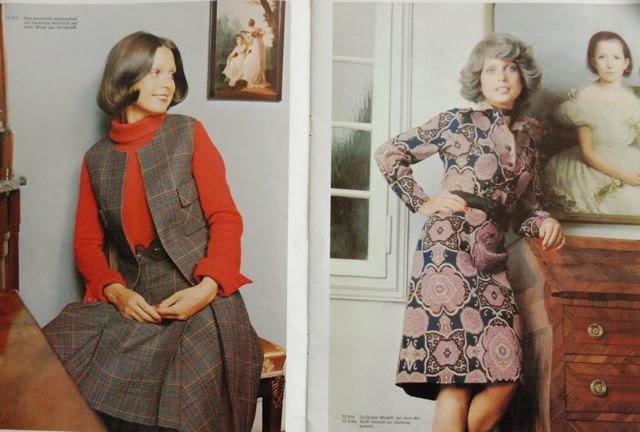 Of course, I've got a vintage pattern stash of my own which I tend to use for inspiration only. 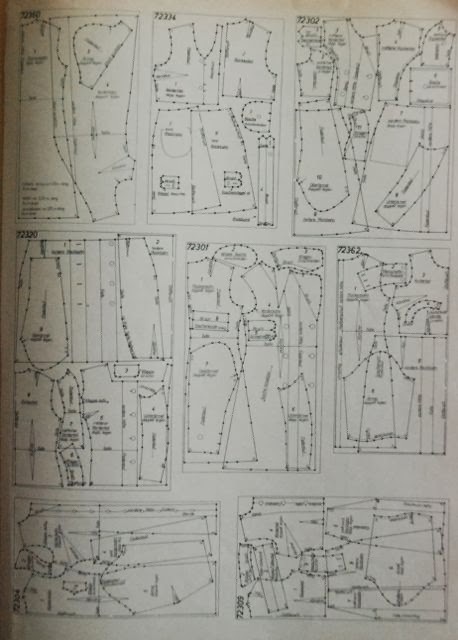 Over 2014, I, Lauriana will sew up at least five of my vintage sewing patterns. And then, there's another matter of sewing community interest. 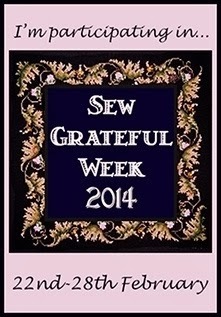 Today Debi posted about the upcoming Sew Grateful Week which she will host again this year. I would like to participate by posting a new pattern tutorial. I'm not sure for what yet. 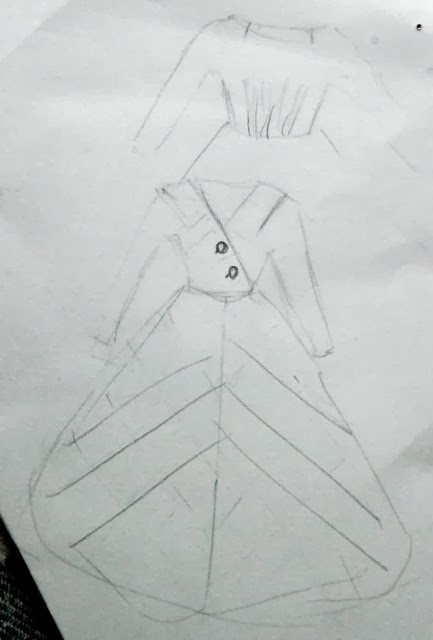 I was thinking about either the half circle cape or about how to make a jumpsuit or playsuit using normal patterns for a bodice and trousers. Which one would you prefer? Or would you like a tutorial for something else I've made? Please keep in mind that I won't have enough time to make and digitize an entire pattern, so anything I make will be more of a how-to. I wrote about this before. I wouldn't have tried this without a book. 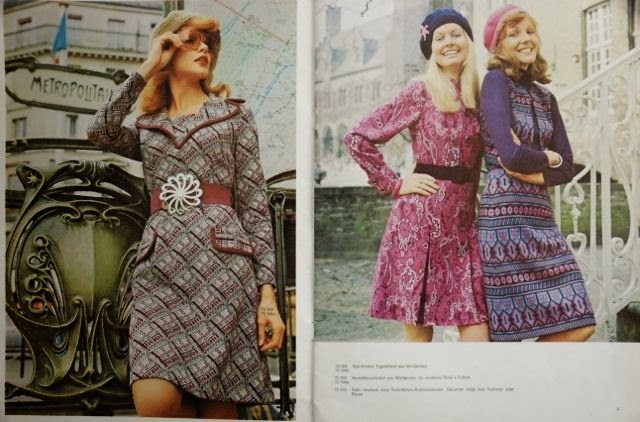 It outlined the basics of muslining in jersey and then converting that pattern to one for knitting. 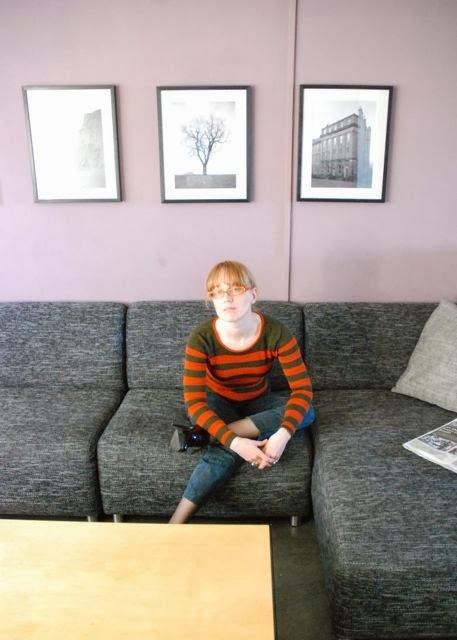 As mentioned before, I decided on a simple fitted sweater with stripes as a first project. Not a difficult thing, but not the easiest either (the easiest thing would be a wide, un-shaped sweater in a solid colour). Of course, knitting stripes is easy, both by machine and by hand. It's just a matter of keeping count. 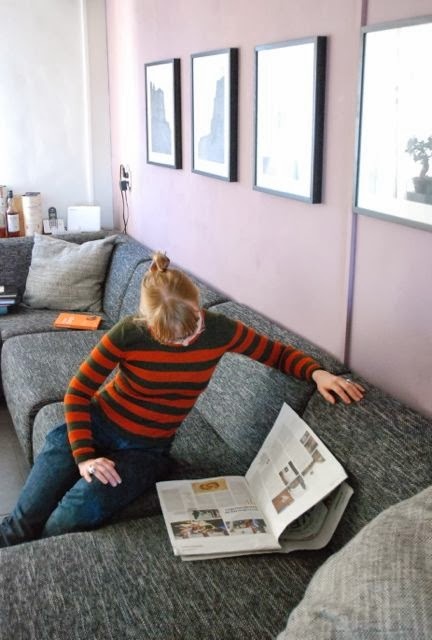 The problem with designing a knitting pattern with stripes, is matching them, especially at the armscyes. I spent quite a bit of time on that in the drawing-on-paper stage. During knitting, I discovered several errors, both in counting (in my instruction, the point where you have to bind off the first stitches for the sleeve head didn't line up with the correct stripe, which I just altered while knitting) and in knitting machine logic (you can only bind off multiple stitches at the side where the sled is… I remembered that when writing the armscye instructions, but not when I got to the neckline). Then, I tried a new-to-me method of finishing the neckline (detail picture in the previous post about this project). It looked good but wasn't very stretchy. Less stretchy than the stockinette stitching it bordered, in fact. So, I had to re-think the neckline. The piece I had started with, was originally supposed to be the front but its tight neckline meant that now became the back. Then, I knitted the other body piece with a deeper neckline. I considered making a V-neck but I learned that the neckline binding I used is only possible on round necklines. Even with the alteration, I still wasn't sure the neckline was going to be wide enough. The sleeves were comparatively easy, apart from the counting error I already mentioned. Blocking was a bit tricky because of that neckline and I realized I might have over-stretched the stitch swatch just a little bit. When assembling the sweater, I learned something else which experienced knitter have probably known for a long time: Stitches which are tied off to create a diagonal edge form a rather un-stretchy edge. This made my sleeve heads smaller than expected. I was able to make them fit (by committing the 'sin' of easing the armscye into the sleevehead) but I know now that I should add some more rows in those bits next time. All in all, I managed to put the whole thing together, it fit over my head and although it turned out bit more fitted than I had expected, that didn't make it unwearable. Although I'm sewing again at the moment, I will try and design for the knitting machine again. I feel like I've learned things from this project and I consider buying another book to get some more information on the subject.